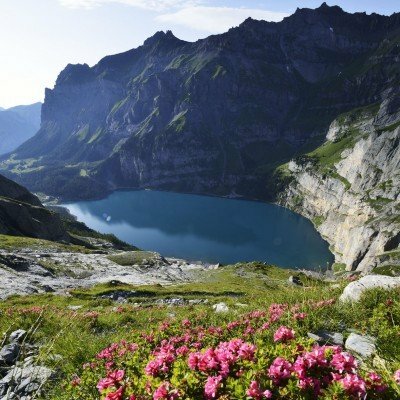 The Alpine flowers are at their most stunning in June, and this is when you will see the famous bright pink Alpenrose, the Edelweiss and up to 25 different species of wild orchid. The long summer days are perfect for high mountain walking, and family activity holidays. From mid September onwards, the climate is typically that of an 'Indian summer' with fabulous red and golden hues and crystal clear air. Here in the Bernese Oberland you will find many of the highest peaks (often over 4,000m), the deepest valleys, the tallest waterfalls, the oldest glaciers and the most beautiful mountain lakes in Switzerland. But it is a region rich in rural charm and rustic beauty too, and time-honoured crafts remain unchanged. You'll see alpine dairies where age-old methods of cheese production before an open fire continue, and traditional wooden chalets with colourful flowers hanging from intricately caved, hand-painted window boxes.